One Night in Winter……a group of teenagers who love poetry – and adore the dead writer Pushkin – dress up in costumes and go out in the streets to play ‘The Game’. Shortly after two of them lie dead in the street. They are in Moscow, it’s June 1945, and the city – indeed the whole of Russia – is celebrating Stalin’s victory over the Nazis. Nobody in Russia is a stranger to death after the war years, but the deaths of these two are something different. The young people – dead and living – are not just ordinary teenagers. The all attend School 801 – the best school in Moscow, the place where the offspring of the great and the powerful are educated at great expense. Don’t think communism means free schooling – this is the school where Stalin’s own children studied. Russian education doesn’t get better or more elite than School 801 where the children of film stars, generals and politicians all rub shoulders. When the secret police or ‘Organs’ are sent to investigate the killings – the so-called ‘Children’s Case’ – it seems to be quite a straightforward matter. Unbelievably, the secret police detain youngsters are sweep them away to the notorious Lubyanka Prison for interrogation. The children are subjected to the sort of techniques more typically used on adults and political prisoners – but toned down a little. After all, their parents are important people and the interrogators need to watch their own backs. Who killed whom, how and why are quickly – if rather superficially – revealed but that’s only the beginning of the ordeal for the children and their parents. The killings are soon consigned to a side-plot, something that goes no further when a book belonging to the dead boy – the velvet covered exercise book in which he wrote about his secret ‘club’ the Fatal Romanics club – is passed to the interrogators. They become convinced that the children are part of a plot to overthrow Stalin and create a new politburo. With something meaty to get their teeth into, the interrogators are soon rounding up even more children. They ‘arrest’ a ten year old boy, a six year old girl, several school teachers and others peripheral to the case. They have to get answers – even where no answers can exist because there is no case to answer. The idea of the plot is clearly nonsense but they can’t tell their bosses to tell Stalin that it was all just a game, a joke, a rather silly teenaged prank. Stalin wants answers so they will get them and they’ll go to any length to give him what he needs whether they give him the truth or just another complicated conspiracy. Soon the children are forced to testify against their parents and teachers. The parents include generals, senior doctors, people close to Stalin himself. Wives beg their husbands to appeal to the ‘Generalissimo’ to release their children but the husbands can show no weakness in front of their leader. Strangely, at times, it feels like Stalin is the least insane of his inner circle, that he’s surrounded by people so corrupt and so sycophantic that he has no way to know what’s real anymore. I won’t say Stalin comes out of this looking like a nice chap – far from it – but it’s clear that the games he plays with his close followers are devious, destructive and deeply demanding but his inner circle are ambitious and ruthless. This is not just a story about the children and their supposed conspiracy. It’s also a love story – or rather several love stories. You’ll be long way into the book before it’s revealed that one of the fathers and one of the mothers of the children are ‘involved’ or that one of the girls herself has a secret love. There are a lot of flawed personalities in the book, most of the characters have secrets or have done dreadful things. There are few heroes or heroines (with the possible exception of the headmistress and one of the teachers) and there are so many tangled threads of plot that it’s occasionally hard to follow what’s going on. This isn’t helped by the calendar-hopping that goes on with the book starting directly after the killing, then hopping back to the first day of the school term then back and forth in time in a rather random way. 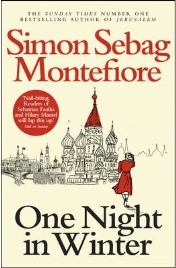 Simon Sebag Montefiore knows his Russian history and he knows Stalin inside out. He has written both fiction and non-fiction about Stalin’s reign and he tells us that this book is fiction with strong roots in a case that actually happened. Faction, if you like. I knew that Montefiore had one multiple prizes for his writing and I approached ‘One Night in Winter’ with a certain degree of trepidation. Would the book be overly academic, would it be too heavy to be enjoyable? The opposite was more the case. In places I found this book to be rather a lightweight plot padded out with lots of historical detail. I found it meandered around as if it wasn’t sure what it was trying to be, but in total, I rather enjoyed it. I knew a little about Stalin and his times from school history lessons, and this book pulled a lot of that together. I enjoyed – if that’s the right word – watching Stalin manipulate his followers, renouncing his own children and then playing off the generals one against the other. There are many sub-plots where the reader is left a little unclear about who really did what and why, but that’s the nature of the era. Nobody can really trust their colleagues, their friends or even their family. We see people renounce one another in order to protect themselves and the people for whom they care and it’s all rather oddly believable. Not everything is completely believable or consistent. The reasons for the killing are rather swiftly swept to one side and the boy we expect to be our guide through the story when he’s introduced at the start of the book soon disappears into the background, only to be pulled out of the bag again right at the end with a revelation that might once have meant a lot but comes so late as to be almost an irrelevance. The love story of the adults knits together well but the younger woman’s story and quite how much it’s linked into the Fatal Romantics and their seeming devotion to her are rather muddled. I read this on a long flight and it kept me awake and attentive throughout. I learned a good deal about life under Stalin but only life for the most privileged whose lives were much more indulged than I’d expected. There are Rolls Royce cars and lavish banquets whilst most of the population can barely eat or buy shoes and little is made of the inequalities, other than by comparing the lot of the boy Andrei whose father has ‘disappeared’ and is presumed dead, and his wealthy class mates. There’s something of interest to all in this book although I suspect that Montefiore is probably a better writer of non-fiction than he is of fiction. And with Stalinist Russia as his field, the truth is often stranger and more compelling that fiction. No Comments on "One Night in Winter"